"A Shaker Legacy: The Shaker Collection at the New York State Museum" is a revised and expanded version of the 1983 publication "Community Industries of the Shakers-A New Look." It details the formation of the Museum's milestone Shaker collection, and provides information about their communal and celibate lifestyle. Four chapters- "Craftmanship in Wood," "The Agricultural Industries," "The Mechanical Arts," and "Textiles and Garments"-describe the Shakers' economic system. 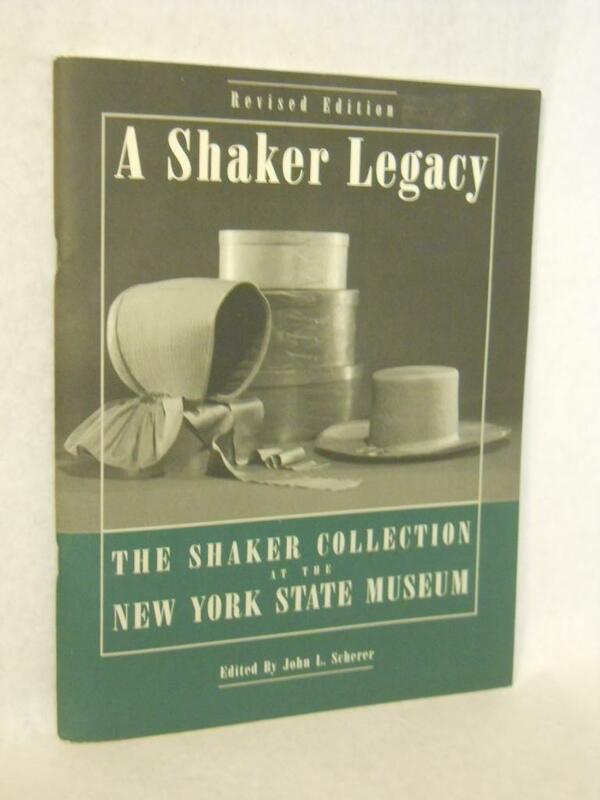 "A Shaker Legacy" edited by John L. Scherer, Associate Curator, contains 55 pages, and is copiously illustrated with over 100 photographs of artifacts from the museum's collection. John Scherer graduated from the New York State University at Albany with a BA in history. He later graduated from the Cooperstown Graduate Program with a MA in Museum Studies and American Folklife. Scherer has been Associate Curator of Decorative Arts at the New York State Museum in Albany since 1967. He has done numerous exhibits relating to New York furniture and decorative arts, the Shakers, historical prints, musical instruments, and popular entertainment, including the circus and theatre. Scherer has also published extensively on these topics, including five museum catalogs, numerous brochures, and articles in publications like The Connoisseur; The Magazine Antiques; Art and Antiques Magazine, and The New York-Pennsylvania Collector. He continues to lecture on a variety of antiques related topics, and teaches a graduate course on material culture at the University at Albany. John Scherer has also been Town Historian for the Town of Clifton Park, Saratoga County since 1978. He was instrumental in setting up a Historic Preservation Commission for the Town and served as its first chairman. He has published three books on Clifton Park history, writes a monthly article on local history for The Community News, a Southern Saratoga County newspaper, and lectures extensively on Clifton Park history. Scherer has also had several articles published in The New England Historical and Genealogical Register. He currently serves on several Town committees, and is chairman of a committee to restore a historic building that will serve as a historical and cultural center for the Town.